Despite forgetting to register to attend, I was still warmly greeted to this ELESIG conference at the University of Bristol. Along with Dewi Parry, we went to this conference that looked at how students can be actively involved in developing and evaluating their own learning. This concept of ‘students as producers’ isn’t really that new. Teaching others has always been recognised as a great way to learn. However, seeing truly is believing. And what this conference allowed us to do was to see examples of good practice, how academics and other professional services staff at the University of Bristol have utilised their students to engage more in their learning and teaching. There were a few stand-out demonstrations/presentations that I was interested in, and I will take the time in this blog to discuss a few. The first came from the Medical School, where students were asked to create an online resource that would benefit their cohorts. The example we saw was from a student who created a video, demonstrating how to perform a clinical examination of an individual who may be suffering from vertigo. The student in question had noticed that there wasn’t an online resource that demonstrated how to perform this particular clinical examination. By producing this resource, not only did the student in question feel like she filled a gap, but also felt that she learned much more. By researching the subject area in more detail, to ensure that the finished product was as accurate and exact as possible, the student was able to learn more. She was also able to present the subject matter to her peers, in a way that would increase their engagement too. The outcome of this project was very positive, and more information can be found here. FeedbackFruits gave a demonstration of their product, a software that in their own words “facilitate blended learning”. Recently, many Cardiff University staff have been interested in using instant response systems in their learning and teaching. We, as a team, have received a lot of enquires about the best tool or software to use. Feedback Fruits was designed to facilitate this instant response aspect, but also do a lot more. As well as letting students instantly respond to questions during lectures, this tool also allows students to work collaboratively outside of teaching hours. Given the time not much was demonstrated on the day, and on paper this tool appears to have a lot of potential. I think a play-around with the software is needed. You can find more about this software here. The last presentation I’d like to mention was by Dr Chris Adams, a Chemistry academic who wanted his students to do more creative group work in their lessons, more specifically using a tool called PeerWise. 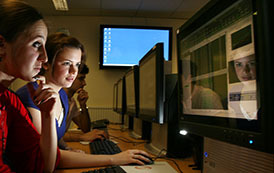 A tool that is developed by Auckland University, it allows students to create their own MCQs (Multiple Choice Questions). The idea being, creating questions, as oppose to always just answering them, would cement learners’ knowledge of a specific topic. And if these questions are then answered by their peers, it would mean less work for the academic. Or so it may seem. A few ‘lessons learned’ came out of the pilot run by Dr Chris Adams. Students did the bare minimum! The task was to create a minimum of 5 questions, and most students apart from a couple only did 5 questions. These questions, and the multiple possible answers, weren’t necessarily correct either. Students need to know about the subject in question in great depth, prior to creating questions and their different answers. If this isn’t the case, then students are introduced to incorrect information that may affect their grasp on the subject or topics in question. Dr Chris Adams, alongside PeerWise, also introduced his students to blogging, and using wikispaces to write blogs, and review each other’s’ blogs. Again, the issue here was the lecturer made too many assumptions – he thought students already knew how to write an effective blog. This suggests that next time, a tutorial on how to write blog posts would be advantageous. In conclusion, this conference was very good for us to see the various projects going on at Bristol University. The three main demonstrations that I’ve mentioned in this blog post will certainly be of interest to some staff here at Cardiff University.